Here’s the G major triad shape from the last post. This chord shape can be used at 3 fret locations in the G major scale that I showed you in the last post: the 3rd fret (G major triad), the 8th fret (C major triad), and the 10th fret (D major triad). The following chord is the shape for the scale-tone minor triad. Since it’s at the 5th fret, it’s the A minor triad (remember that with these shapes, we name the triad using the note-name on the high E string – 5th fret, high E string is an A). In G major, this shape is used at the 5th fret (A minor triad), the 7th fret (B minor triad), and the 12th fret (E minor triad). G major (3rd fret), A minor (5th fret), B minor (7th fret), C major (8th fret), D major (10th fret), and E minor (12th fret). 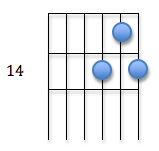 Looking at the scale below, try to visualize the major and minor shapes at the correct frets. The last chord isn’t used that much. It’s called the diminished chord. It’s the final chord of the scale-tone series, and it’s placed at the 14th fret. Finding a way to use it in your songs will give them a different flavor. as a scale, going sequentially from G major to E minor and back. moving randomly from chord to chord. playing just two of the notes (any two) simultaneously while moving between chords. Record a jam track using open-string chords in the key of G. Use the ideas I just mentioned to play along with it. Depending on how you do this, it can sound like a solo, or as a background part for a song.